This is an unforgettable experience. 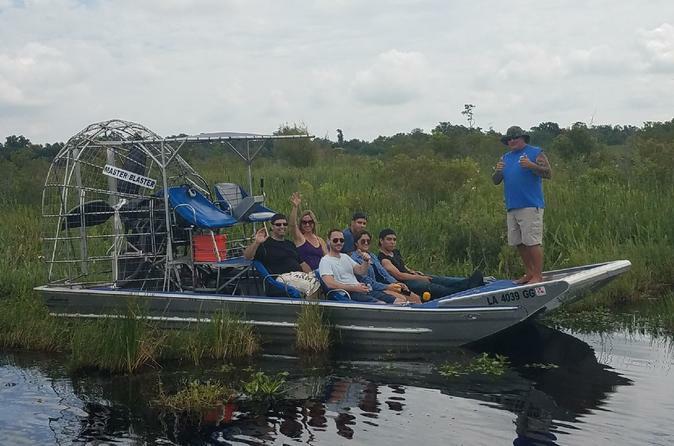 Enjoy a private airboat experience for up to 6 passengers on a high speed airboat. You will have chauffeured ground transportation in a SUV, Limo or Black Executive Van, depending on size of your group. You driver will arrive at your door step for a 4 hour experience. Your driver will supply chilled sodas and bottle water for your trip.Travel about 35 to 45 minutes to the swamp tour dock, where your captain will await your arrival. Get about 15 to 20 minutes at the dock to use the restroom, go to the souvenir shop and enjoy the ambiance of the bayous. Spend an unforgettable 1 hour 40 minutes on the water with your licensed USCG captain. You will get gators up close, real close. Return back to the dock where your driver will be awaiting your return to deliver you back to your pick up location. Get a complimentary bottle of champagne on the air boat as part of your experience. Choose from one of four departure times when you book. Your adventure begins with hotel pickup in your private chauffeured vehicle. The driver will supply chilled bottled water and sodas. At your discretion, the driver can stop along the way for the passengers to purchase snacks and/or adult beverages (own expense). You will travel 30 to 45 minutes to the swamp tour dock in Crown Point. Upon arrival, you will spend about 15 minutes visiting the gift shop, using the restroom, and enjoying the ambiance of the bayou. Then, board the 6-passenger airboat where your licensed USCG captain is awaiting your arrival. Each captain is a native of the area and will entertain you on this 1 hour 40 minute airboat adventure. The trip is part ride and part tour, where your captain stops to talk about the wildlife and flora of the swamps. You will get close to gators during the warmer days of the year. Yes, gators do hibernate, but in warmer days of the winter they will often be caught sunning themselves on the bank. Each trip is different and unique; you never know what you will view along the way. During the trip, the captain will supply the group with Champagne and flutes for the group to celebrate their experience. As the captain returns to the swamp tour dock, you will get 15 minutes to stretch your legs, use the restroom and visit the gift shop. Your driver will be at the dock awaiting your return back to your original pickup location.